I tell all my beginning students, whether they are 3 or 63, that there are three different ways to learn a piece of music: by ear, by rote, or by reading. Learning music is about learning patterns. The aural patterns of the pitch, harmonies and rhythms, the visual patterns of the black and white keys on the keyboard, and the visual patterns of musical notation. A truly well-rounded education encourages students to become adept at understanding all of these. Too often this is completely overlooked in more traditional piano lessons. I certainly was never taught how to play by ear and only really learnt how to do this when I returned to piano and teaching as an adult. There’s a myth that you can either play by ear or you can’t – that it’s an inherent skill you’re either born with or not. And whilst it is certainly true that some find it easier than others (just as some find learning to read music easier than others) – it can be taught to anyone. For complete beginners we’ll start with a two or three pitch tune such as ‘See Saw’ or ‘Mary Had a Little Lamb’ – focusing on the movement of the pitch up, down and repeating (often the hardest to hear). Once the basic melody is learnt we’ll transpose it into different keys, finding the different patterns of black and white notes on the keyboard. We’ll talk about the concept of the key or the ‘home’ note – the one that makes it sound finished. And then we’ll learn to harmonise. Harmony is the chocolate sauce to the melody’s ice cream – i.e. ice cream is nice on its own but it is enhanced massively by chocolate sauce. We’ll start by harmonising with just two notes (or chords for older students) – Mary had a Little Lamb being a perfect example. Then we’ll progress to songs needing three or more harmony notes – Leonard Cohen’s Hallelujah being a popular choice for adult students who often learn this very soon after commencing piano. By teaching harmony we also learn about pulse – because not only do we need to know what note/chord to play but also when to play it – and the answer lies on the strong beats. Here’s Keiva,7, who worked out how to play Twinkle Twinkle Little Star by ear, harmonised it, and then created her own arrangement using different left hand patterns and adapting the melody: “Keiva’s Little Star”. We will also transpose harmonised pieces so that students learn which notes / chords to expect depending on what key they are playing in – later on they learn about the function of chords and can find chords 1, 4, 5 and 6 (and others) in different keys. They quickly realise that many songs they know share the same chord progressions, even if they may be written in different keys. This can lead to great fun with ‘mash-ups’ where the student transposes two songs which share a progression into the same key and creates their own arrangement of both. Here’s Jem, 8, playing a mash-up of Ed Sheeran’s Castle on the Hill and George Ezra’s Shotgun – both of which he learnt by ear – accompanied by a backing track app which I often use in my teaching. 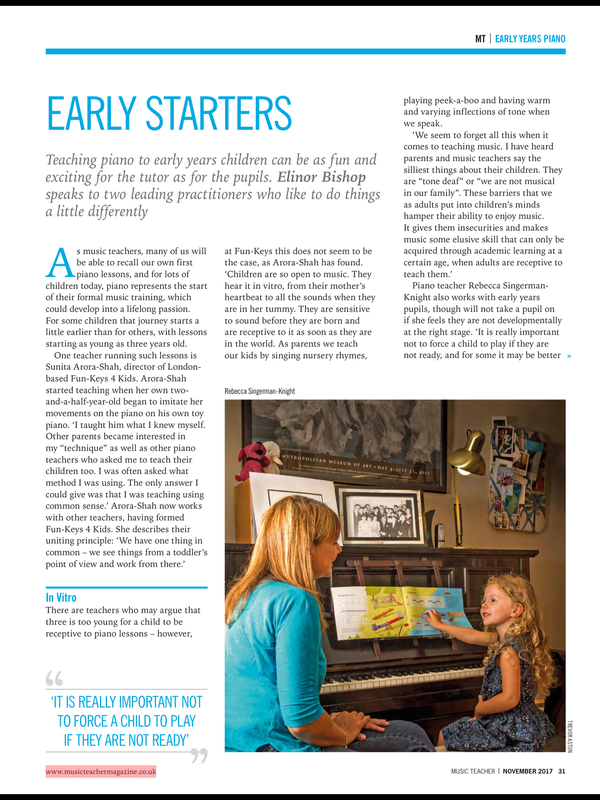 Rote teaching has recently become much more popular in Piano Teaching circles and rightly so. However, it has traditionally been criticised for teaching children to play more complicated pieces than they are able to read and thus discouraging them from wanting to learn to read – the pieces they are able to read in the early days seem comparatively boring. However, because I make it clear from the outset that I teach pieces in three different ways – and, to begin with at least, the ‘reading’ pieces may be the simplest – I have never found this to be a problem as expectations are clearly managed. Rote teaching really encourages students to become familiar with the pattern of white and black keys on the keyboard. I also teach pentascales and chord shapes fairly early on so that students are able to recognise the patterns of the different keys and can relate this to pieces they are learning. Rote learning encourages them to use the whole of the keyboard and not just a few notes around middle C. Often they also use the pedal to great effect. As students progress, rote learning is often combined with and superseded by learning by ear – the more knowledge they have of melody and harmony the better they can work out songs for themselves. Of course a purely classical approach to piano teaching would only really focus on this way of learning pieces. This was certainly the teaching that I received. Lesson one – open a book and point to middle C. Many students may gravitate to this way of learning – particularly if they are wanting to play the classical repertoire. However, for many students a reading-only approach is much too restrictive and can result in putting them off the piano altogether. I do not start teaching notation to beginner students for a few weeks at least – depending on their age and abilities. Often I won’t introduce notation for a number of months, particularly for very young students. (I have a small number of adult students to whom I don’t teach notation at all – they are not interested and / or find it too difficult – rather we just focus on developing a really thorough understanding of chord patterns, learning songs of increasing complexity by ear as well as their own improvising and arranging). I always begin with rote teaching – so that they learn about the piano keyboard; and ear pieces – so they learn the basics of melody, harmony, beat and rhythm. This is all re-enforced with improvisations and maybe their own compositions. When notation is introduced they find it easier to relate it to what they already know: they can see that the contours of up and down in the notation mirror what they already recognise in terms of the patterns of up and down in pitch and on the piano. I explicitly refer to the pieces that they are learning by notation as their ‘reading pieces’ so they understand that these are invariably simpler (to begin with) than other pieces they may be playing already. As students choose to learn specific songs (often pop songs or songs from films) I will often use a combination of all three approaches, tailored to the individual in terms of what they find easiest. I will encourage them to work out basic melodies and harmonies (i.e. chord progressions) by ear – using their knowledge of how chords work to help. Some students may need a fair amount of prompting to get there – so elements of rote teaching come into play. And for those students who find reading easier I may also use some sheet music as a prompt for this. Notated arrangements of pop songs are often complex – primarily due to the rhythmic syncopations – so I encourage the students to use this as a guide only to assist them in playing what they hear. They may also use the chord symbols to help with the chord progressions. But I rarely encourage them to play exactly what is written – rather to create their own arrangements suitable to their ability level and tastes. Here’s Gabriel, 10, performing his own arrangement of “This is Me’ from The Greatest Showman. This is an arrangement that involves playing the melody by ear and block chords in the left hand. (As students get more advanced, we learn different left hand patterns and also learn how to voice chords in the right hand so that the melody is projected). He worked this out primarily by ear, with some prompting by me in the form of rote teaching. This is played in D – the original key. Here is Elizabeth, 9, who had only been having lessons for 6 months when she performed this arrangement of Jar of Hearts at my student concert. Because she had not been playing long, I transposed this into the key of C for her and she used basic fifths in the left hand with the melody in the right hand. She learnt this mainly by rote, but helped by working out aspects of the melody by ear. My views on the exam system are detailed in other blogs (see here and here for examples). The majority of my students choose not to take formal exams. Rather I hold 2 concerts per year to provide all my young students with a performing opportunity, as well as periodic house concerts for my adult students. Of my young students, less than half choose to take exams and only two out of my 20+ adult students do. Clearly when preparing for exams, the learning is predominantly via reading. However, the students’ knowledge of scale and chord patterns gained from rote and ear work certainly speeds up the process of interpreting the dots on the page! I also ensure that there is a break of at least 9-12 months between exams to focus on all the other ways of learning pieces, as well as other activities. This does mean that my students tend to take longer than some of their peers to go through the ‘system’ – but I am very confident that they end up being much more well-rounded musicians than those who are on the exam treadmill. Even more importantly I think there is less chance of students’ giving up the piano altogether when they are given a variety of ways to learn the music that most interests them. 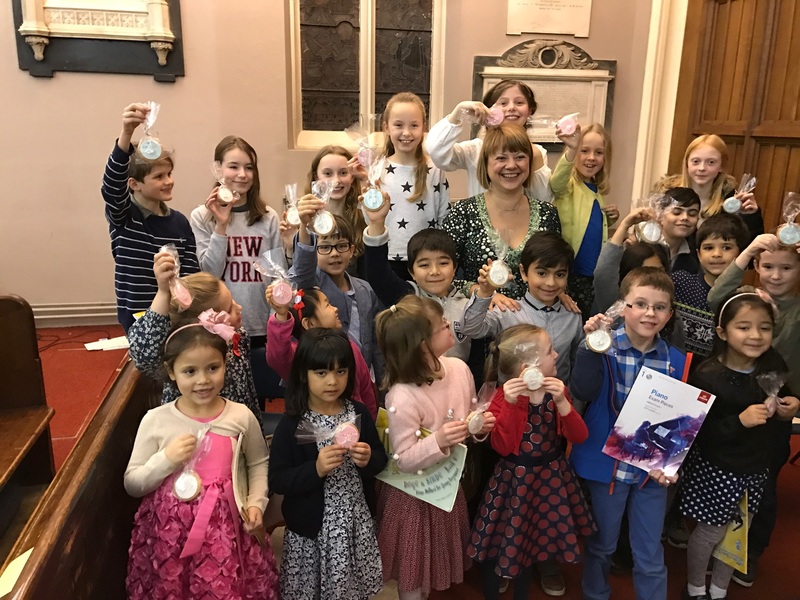 My primary aim in teaching is to encourage a lifelong love of playing the piano and I find that this way of teaching offers the best chance in meeting this aim. 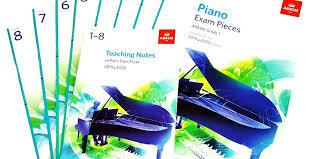 I was very pleased to be able to write a review of the new ABRSM 2019 – 2020 syllabus for the excellent blog by Tim Topham. Tim is an internationally-renowned music educator, piano teacher, writer and presenter. Through his blog and podcast at timtopham.com, he regularly inspires more than 20,000 teachers across the globe to become better educators for their students. He has also set-up an international community of dedicated and creative teachers – his Inner Circle – of which I am very pleased to be a member. Readers of my blog will know my views on the place of piano exams in a musical education. Whilst exams can be an excellent motivator for some students, too much focus on exams can be detrimental to the development of all-round musicianship and, at worst, can put a student off playing the piano altogether. Many of my students choose not to go down the exam route and I will only enter students for exams when they are fully ready. Please refer to my ‘Guiding Principles‘ for more information about my approach to piano exams. And at the age of 10 here she is introducing and playing her own ‘untitled’ composition, and challenging the audience to see if they could tell what it was about! I often bore friends and family by saying I have the best job in the world. But I really do. And watching my students grow and develop, not just as pianists but as young people, is a real privilege. For more videos of the performances from Saturday please head over to my Facebook page where I will be posting a new video every day in December as part of an ‘Advent’ project. 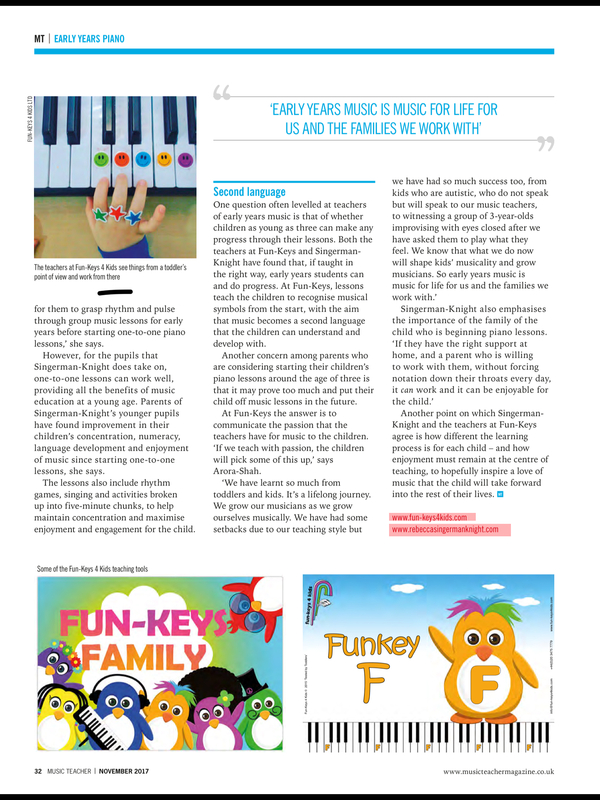 I was delighted to be asked to feature in the November 2017 edition of Music Teacher Magazine talking about my role in early years’ piano tuition. The feature is shown below and to purchase a full digital copy of the complete edition please follow this link. And here she is two years’ later – poised and confident! During the month of December I am posting a different video every day as part of an ‘Advent Project’. Finally, here is a wonderful photo of all my performers showing off their home-made, personalised biscuits!